Learn why you develop neck pain, headache and migraine. Learn how the neck influences your headaches and migraines. This book explains how stress chemicals increase your pain and how to reduce stress chemicals. Discover why these three conditions occur together and how to alleviate them without reaching for pills. 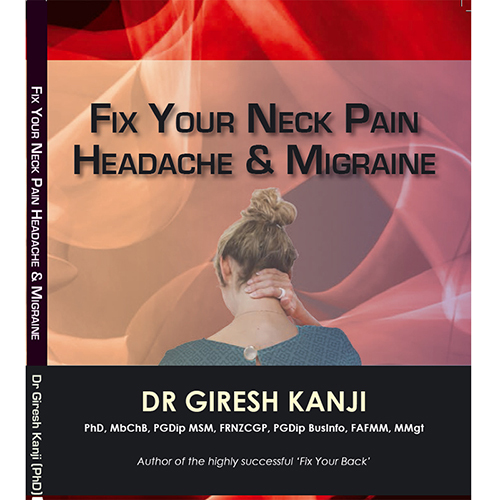 Fix Your Neck Pain Headache and Migraine has just been released in August 2015 with the book being launched at Unity Books Wellington on August 20 2015. Learn how you can treat your headaches with simple strategies. Learn what causes neck pain, how it can turn into headache and the relevance of migraine. Full colour gloss and easy to read. Now available at Whitcoulls, Paper Plus, Unity Books and bookstores throughout New Zealand.